The Kata Prism U Backpack is part of the Kata Ergo-Tech series of bags. It is designed to protect and carry a digital camera, MP3/MP4 player, PDA, cell phone and laptop computer with accessories. The bag is made from Elasto-Guard a material which is flexible and will adjust to the ever changing shapes and movements of the user's body, while it is also able to shift shape in order to fit the variable equipment within. The bag is carried by a carry handle or ergonomic backpack straps. It has designated safe guard zones that feature internal modular padded divisions and external Flexi-Shield reinforcement for greater protection of the equipment. Main compartment is divided in two with a zippered division that can be undone to create one large space. 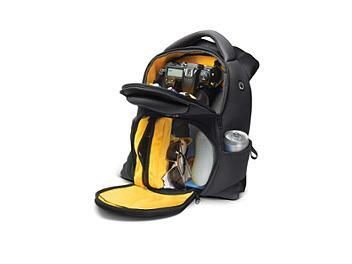 Two low profile high capacity side pockets will hold water bottles etc. Lower compartment section has a flat flexible zip pocket. Flexi-Shield: High frequency molded flexible reinforcement appears in the form of ridges on the exterior of the safe guard zones for ultimate protection.